OK, I found something else to pass along–dinner. I had another “light” dish from the Everyday Food Light cookbook. 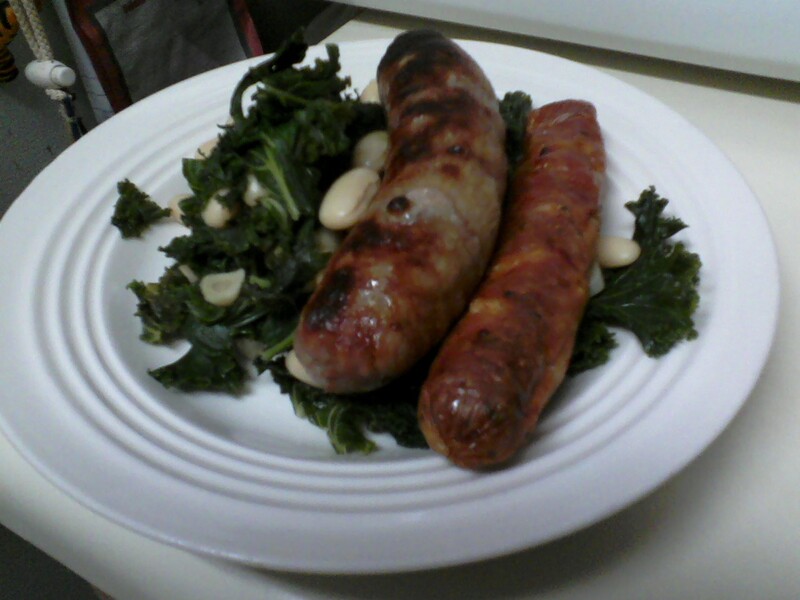 This one is on page 329, Sausages with Kale and White Beans. (You can find the recipe online here.) I’ve never had kale before, but I have to say, cooked as long as it did, it’s not bad. I’ll try using kale again one day. At 99 cents for a large bunch, it’s certainly affordable. I decided to pull two packets of sausages out of the freezer (the stuff I bought on sale recently), but they weren’t the same thing. One was turkey brats, the other was some chicken with sun-dried tomatoes and asiago, I think–the Market Pantry brand from Target. So when I finished, I split them up–each serving had one of each in it. Pretty simple, just broiling the sausages in the countertop oven (you do have one, right?) and then cooking the kale on top the stove with garlic and a half cup of water until it’s wilted all the way down. Then toss in two tablespoons of white wine vinegar and a can of rinsed cannellini beans. It’s not haute cuisine, but it’s a pretty good dinner done in a half hour or so. Not bad. I should also mention that I just LOVE cannellini beans. If you’re not familiar with them–and I wasn’t until a few years ago–they’re white kidney beans, frequently imported from Italy. One of my favorite ways to use them is in this amazingly delicious white bean mash. I’ve also used Great Northern or White Navy beans, but that’s only because I grabbed them by mistake. Those beans are OK, and they’ll work in this recipe, but. . .just not as good as cannellini. In a large bowl, whisk together lemon juice, oil and mustard; season with salt and pepper. Add beans, onion and olives; toss to combine. Posted by Amy on January 16, 2013 in Cookbooks, Fast & Easy, What's for Dinner?